While Christmas at mom’s was a story of Canastic proportions, Christmas at dad’s was a righteous shuffle boarding shufflefest. 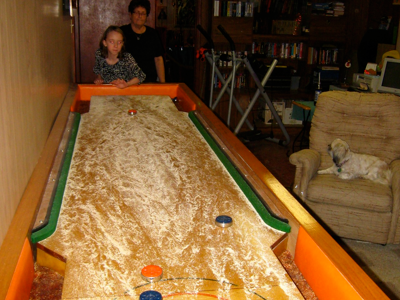 Jazz and I played about 37 games in dad’s basement. We’re both crack shuffle boarders now. Christmas at dad’s was also the second leg of a long stretch of doing nothing. I have to say, that while nothing is one of my favourite things to do, it’s nothing to write home about. I felt like I wanted to do something, but I couldn’t think of anything in particular. I just didn’t have the energy for it. What a state of mind! I spent the night in Strasbourg and left Jazzy there when I hit the highway at about 6pm yesterday. From the car I phoned Nicole and we met at La Bodega for drinks. It seems that doing nothing while drinking and talking with a friend was exactly what I needed. We both had a load on our minds. While I had already made a decision about what to do with my troubled thoughts, she was still at a loss with her own. At this point I pulled out my notepad and together we weighed the pros and cons of her situation. After two pints she was drunk, thoroughly analyzed, exceeded her daily quota for laughter, and still completely confused. At best, it seems we provided a great distraction for each other. I guess that’s what friends are for.